At what age can a cocker spaniel start training, especially potty training? Mine is 6 weeks old and I'm beginning to worry that I've left it too late. He already has preferences - only the living room and kitchen - NOT any of the places I take him to! Even after a nap, he waits until I lose patience and let him into the hall. You can begin training puppies as early as four or five weeks old - sometimes earlier. While they're still very young their mother will clean up after them so that there's no mess in the whelping box. When you get your puppy home it's up to you to teach him where he can and can't 'go'. Don't worry, it's certainly not too late to begin house training your puppy now, but rather than repeat myself, which I'm often guilty of, I'd like to direct you to these articles if I may. You'll find lots of tips and advice on how to potty train your puppy and for good measure a few puppy obedience sessions to help you with his training. It may take a little patience and understanding, but I'm sure you'll both get there in the end. Another (very important) part of your puppy's training is socialization and I recommend you begin that right away - the sooner the better. Read the article to understand why it's important, and what you can do to make sure your puppy grows up to be happy and confident in most situations. In short, puppy training can begin as early as you like, and perhaps should be started as early as possible. Puppy training usually begins at the breeders. The puppy's mother will have begun 'training' her puppy to behave in an acceptable way when playing with its brothers and sisters. A good breeder will have begun the socialization process and may have started potty training. Many puppies leave the breeders already toilet trained. I believe there is a 'window' somewhere around 10-12 weeks (not sure about the timing) where a puppy is more receptive to training and socialization. This is an ideal time to get in as much training as you possibly can. Don't forget, training should be carried on throughout a dog's life, not just during puppyhood. 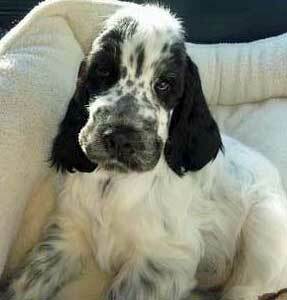 Enjoy your cocker spaniel puppy!